Greetings from Massachusetts Postcard. Available at Legends’ General Store. Officially the Commonwealth of Massachusetts, the state has played a significant historical, cultural, and commercial role in American history. Plymouth was the site of the colony founded in 1620 by the Pilgrims, passengers of the Mayflower. Harvard University, founded in 1636, is the oldest institution of higher learning in the United States. In 1692, the towns surrounding Salem experienced one of America’s most infamous cases of mass hysteria, the Salem Witch Trials. In the late 18th century, Boston became known as the “Cradle of Liberty” for the agitation there that led to the American Revolution and the independence of the United States from Great Britain. 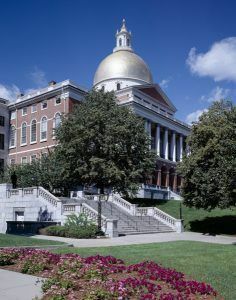 A visit to Massachusetts is an opportunity to walk in the footsteps of history at easily seen iconic buildings, landscapes, memorials and museums. 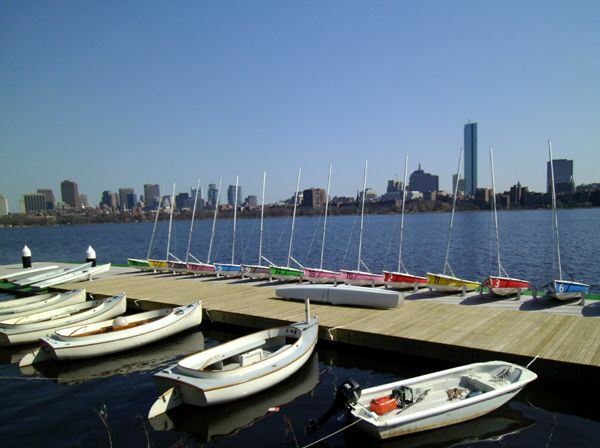 For outdoor enthusiasts, Massachusetts offers forests covering 3,060,000 acres, kayaking and canoeing on the Essex and Ipswich Rivers, and sailing on the Charles River in Boston. If you just want to enjoy a little fun in the sun, visit Revere Beach, America’s first public beach, or swim though history at Walden Pond in Concord, where Henry David Thoreau once lived. In the winter, visitors enjoy skiing at Canterbury Farm Cross Country Ski Area and Wachusett Mountain Ski Area in Central Massachusetts. From Cape Cod to the Berkshires, Boston to Martha’s Vineyard, Massachusetts has unbelievably diverse sightseeing to offer. Whether you want to explore on your own, or join an organized tour, there is an abundance of opportunities in this great state. Massachusetts Flag – On a white field is a blue shield emblazoned with the image of a Native American, Massachuset. He holds a bow in one hand and an arrow in the other. The arrow is pointing downward representing peace. 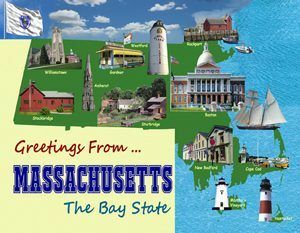 The white star represents Massachusetts as one of the original thirteen states. Around the shield is a blue ribbon with the motto: ” By the Sword We Seek Peace, but Peace Only Under Liberty”. Above the shield is a arm and sword, representing the first part of the motto. 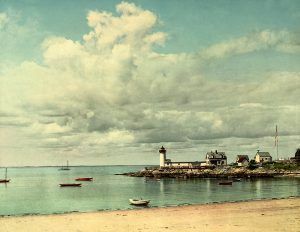 Annisquam Light, Gloucester, MA, Detroit Photographic Co, 1904. Click for prints, downloads and products. Lizzie Borden – Killer of Fall River, Massachusetts? Massachusetts State House and Capitol, Boston. Photo by Carol Highsmith. Click for prints and products. Sailboats in front of Boston skyline, photo by Ella Nobo, Legends of America’s granddaughter in training.